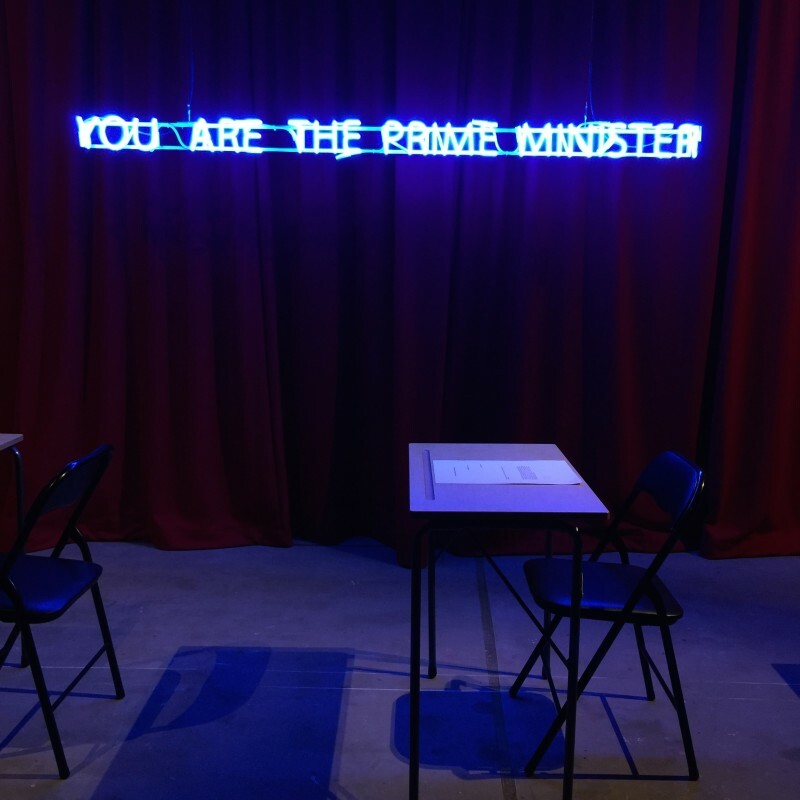 My last stay in Sydney coincided with the 20th Biennale. I was super excited to uncover this event and to see the city celebrating contemporary art at its best. 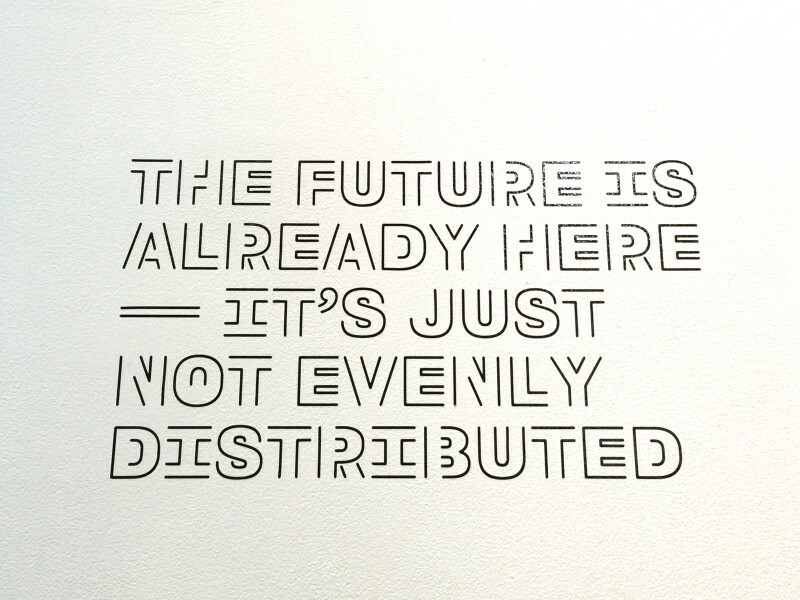 The theme chosen for this Biennale is “the future is already here. It’s just not evenly distributed”. The starting point is this sentence from William Gibson, the American/Canadian “cyberpunk” writer. It’s definitely about the “now”. At a time where the internet is ubiquitous in our lives and taken for granted, we are reminded that access to information and other basic resources is by no mean universal as “many people are denied the opportunity to benefit from (or participate in) these new spaces where information can be exchanged”. The Biennale is spread between 6 main exhibition places of very different sizes, called “embassies”. Each embassy tackles a thematic cluster. There were lots of videos (mainly) and installations, some sculptures. However, very few paintings and photography works. Art is a complicated subject to discuss. So I am going to be partial when I tell you what, in my view, is worth the trip. I would love to have your impression about what you found the most interesting if you attended the event. 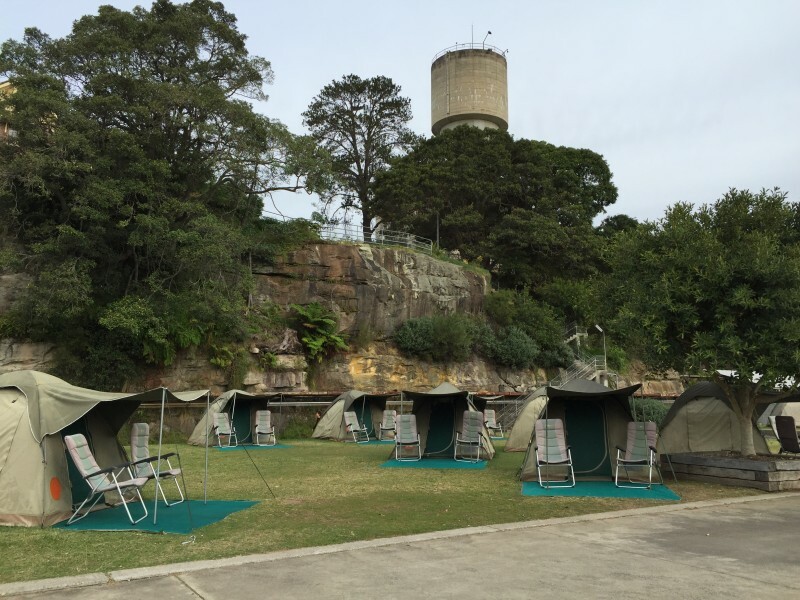 If you are very short on time, there is just one place to go: Cockatoo Island. It’s the first embassy, and it’s definitely the highlight of the Biennale. Cockatoo Island is a UNESCO world-heritage-listed island in the middle of Sydney Harbour. 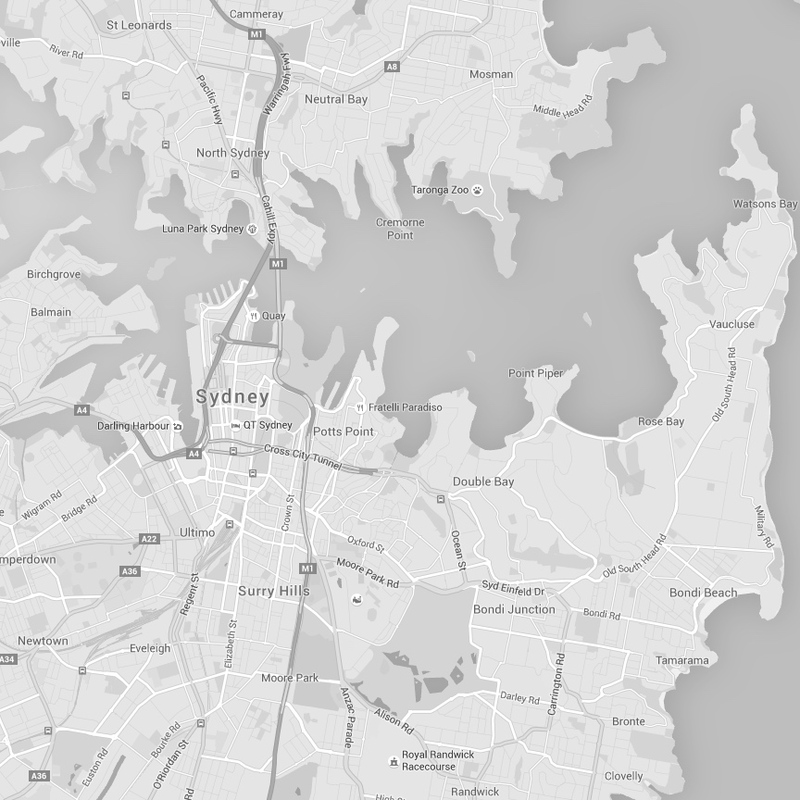 It’s accessible from Circular Quay. Don’t do what I did: wait for the advertised free shuttle supposed to depart from Campbell’s Cove wharf. Those shuttles only operate three days during the whole period of the Biennale. Misleading information. Getting back to Cockatoo Island. 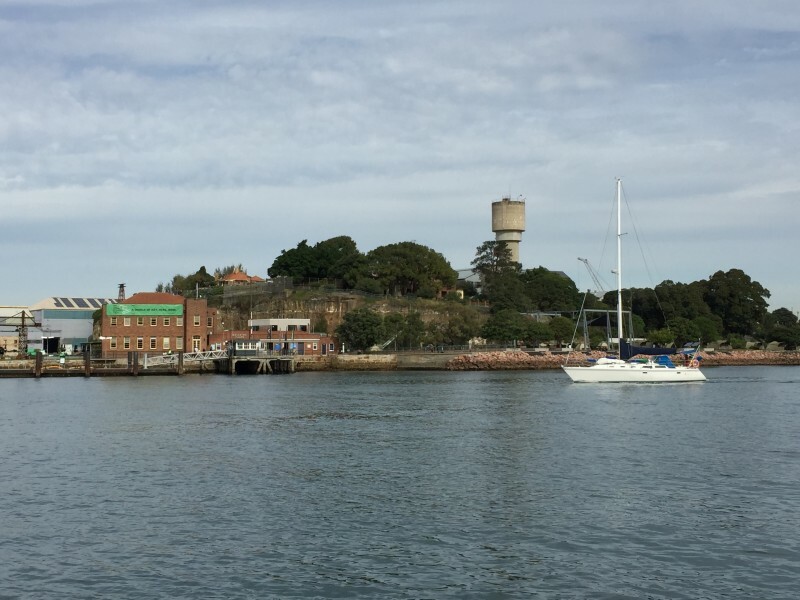 The place had many uses throughout history: at first, it was a convict settlement, then, an Industrial School for Girls and a reformatory and finally, a shipyard, becoming the major shipbuilding and dockyard facility for the South West Pacific in WWII. It finally closed in 1992. Today the site is used for cultural events. You can even sleep on site, though I found it a bit spooky at the end of the day. 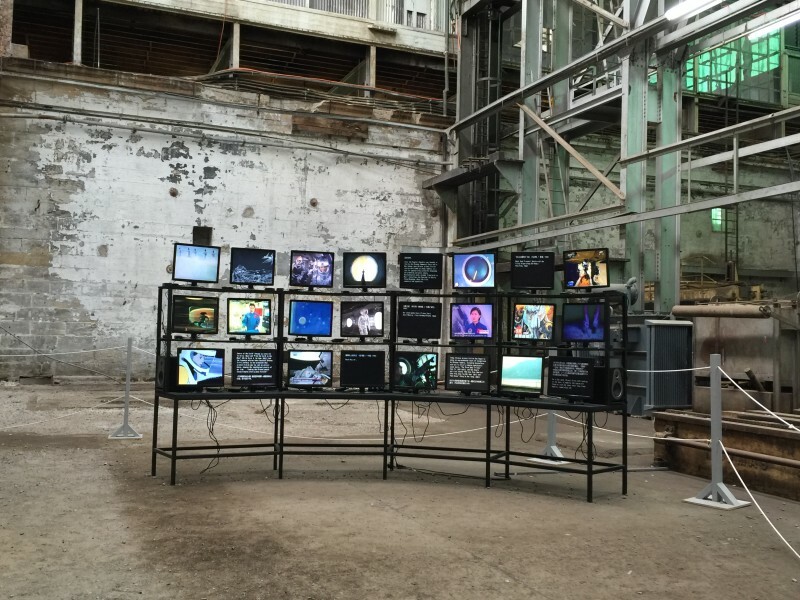 It’s a great site from industrial archaeology lovers and a fantastic venue for contemporary art. The old building and machinery enhance the works and give them another dimension. 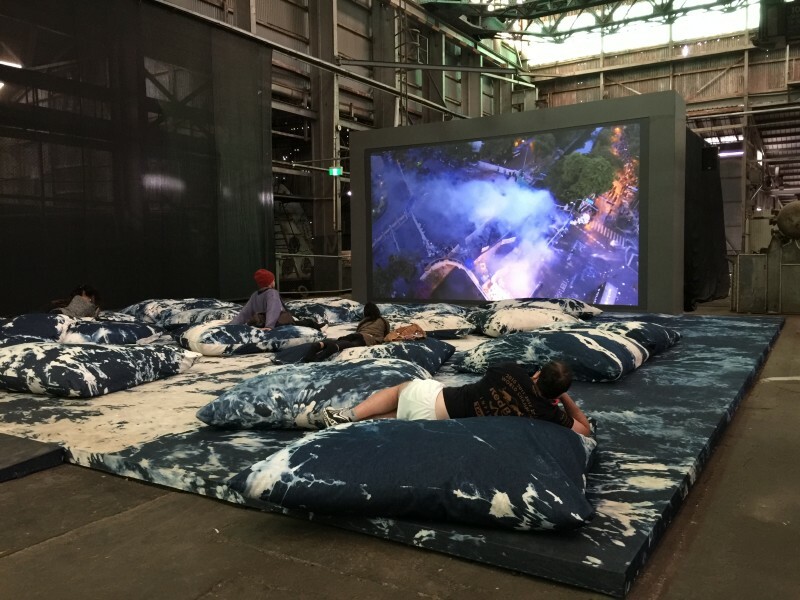 Cockatoo Island is the Embassy of the Real. Artists were here invited to explore the way we perceive reality in an increasingly digital era. Theirs works investigate an in-between space where the virtual realm and the physical world overlap. These are the works I liked the most. Korakrit Arunanondchai, a Thai artist, presents a video that intertwines contemporary themes with mythical Thai figures like garudas and Naga. His intention is to “map out a techno-animism” reality. Ming Wong is a Singaporean artist renowned for video works that reimagine excerpts from art films and world cinema. He has a broad range of inspiration sources from the traditions of Cantonese Opera to science-fiction films from the 60’s and 70’S. I particularly appreciated the works of Camille Henrot, the versatile French artist. There is a video entitled “Grosse Fatigue”, telling the story of the creation of the universe from a computer screen, set to the words of a poem drawn from the creation myths of Christianity, Buddhism, Kabbalah, Navajo and Inuit traditions. Besides this, voluptuous bronze sculptures are also presented. Xu Zhen is an iconic figure in contemporary Chinese art whose works take many forms. 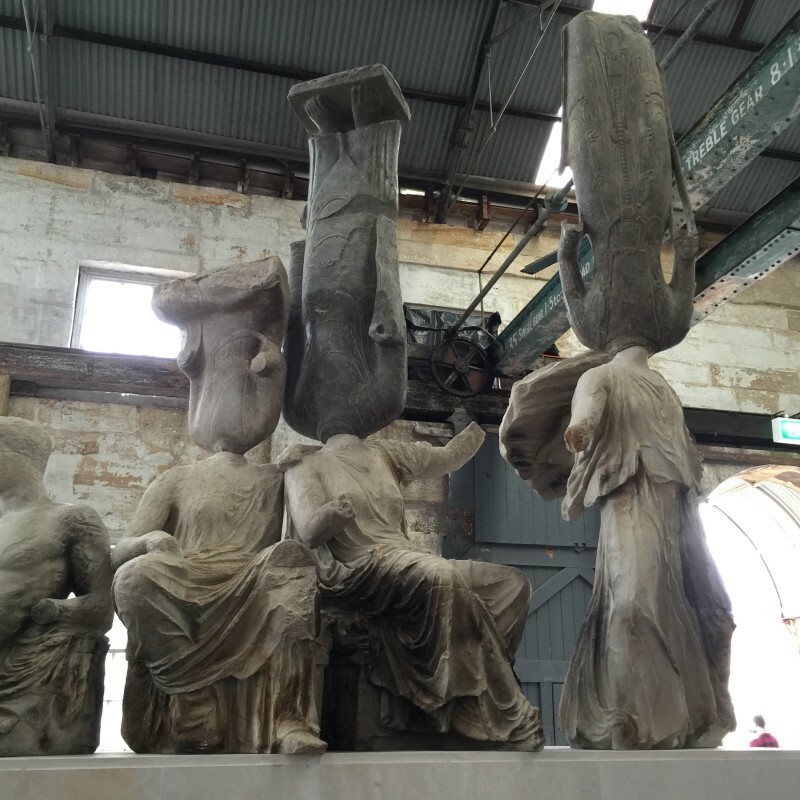 The work presented is an impressive series of sculptures mixing ancient Greek statues like those from the Parthenon pediment with Chinese Buddhist elements, creating a hybrid Eastern-Western monument as a reflexion on globalisation. 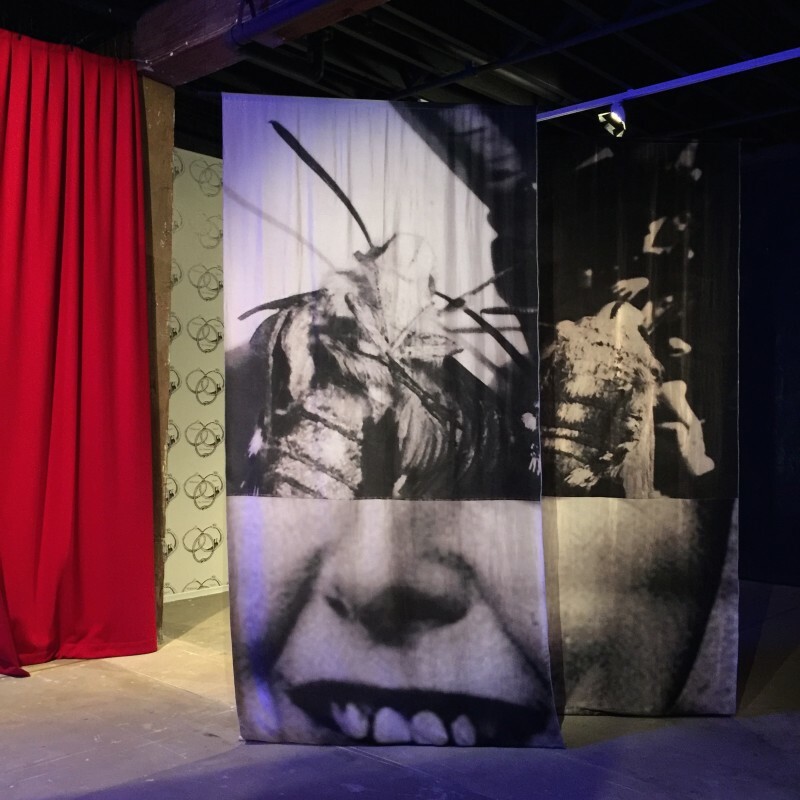 Cécile B. Evans, an American artist, created an interesting work, mixing video and virtual reality. You experience her work by putting on virtual reality goggles and walking through a long tunnel, holding on tight to a handrail to guide your steps. At the end of the ride, after taking off the goggles, the video continues. 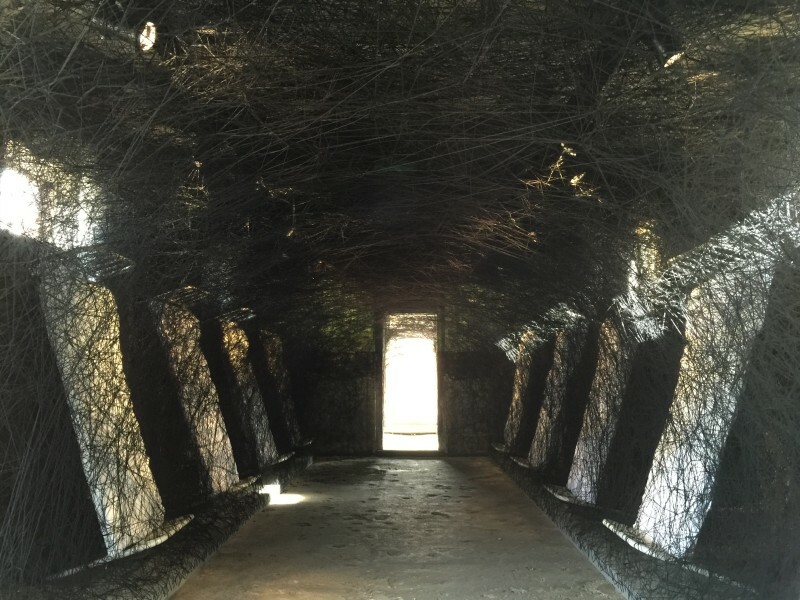 Chiharu Shiota, an artist from Japan, devised a very strange and puzzling work entitled “Conscious Sleep”. 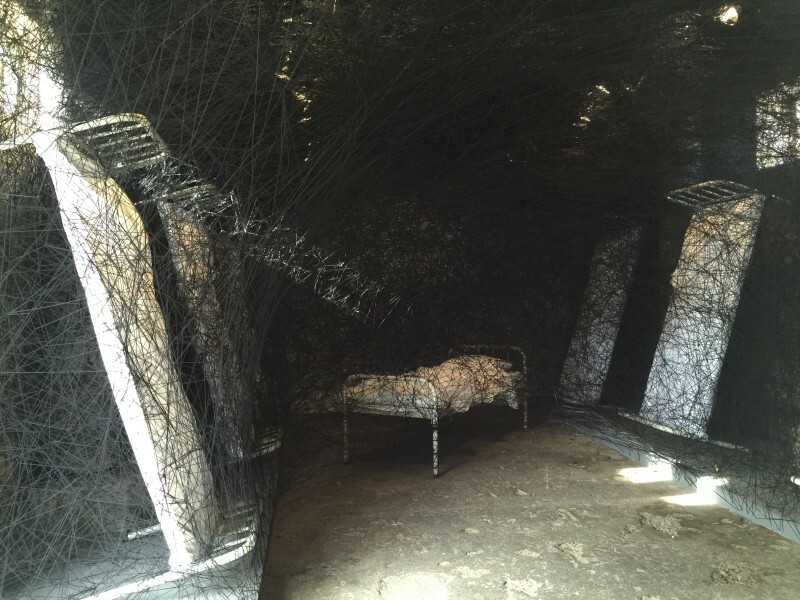 The work consists of a web of black wool woven in a way that it imprisons a series of beds. The threads are seen as creating links between thoughts and memory. 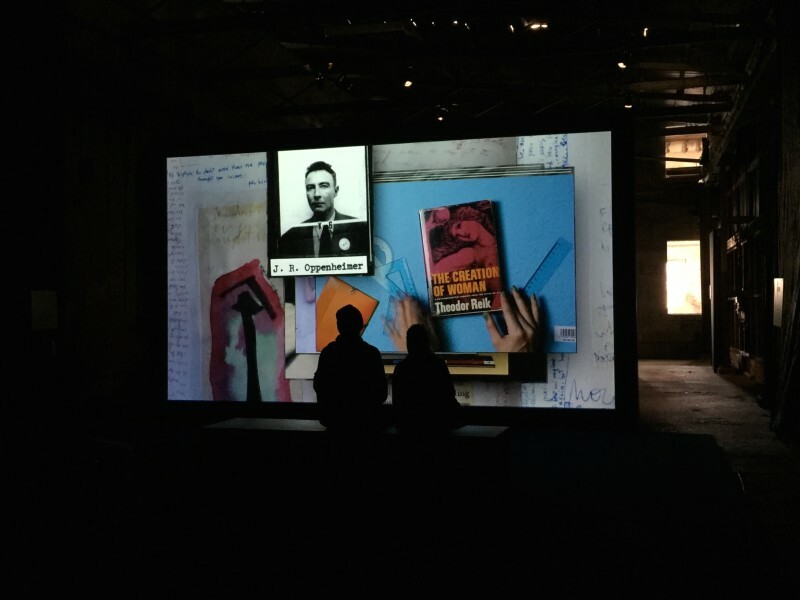 It was astonishing to have a 1965 Samuel Beckett movie as part of the Biennale, but it totally matched the theme. It is a black-and-white movie starring Buster Keaton who spends the duration of the film avoiding the camera. In the framework of the Biennale, this piece is interpreted as follows: “in digital space, it is possible to be ever-present, invisible and anonymous, hidden in plain sight behind the uniquitous black screen of technology”. 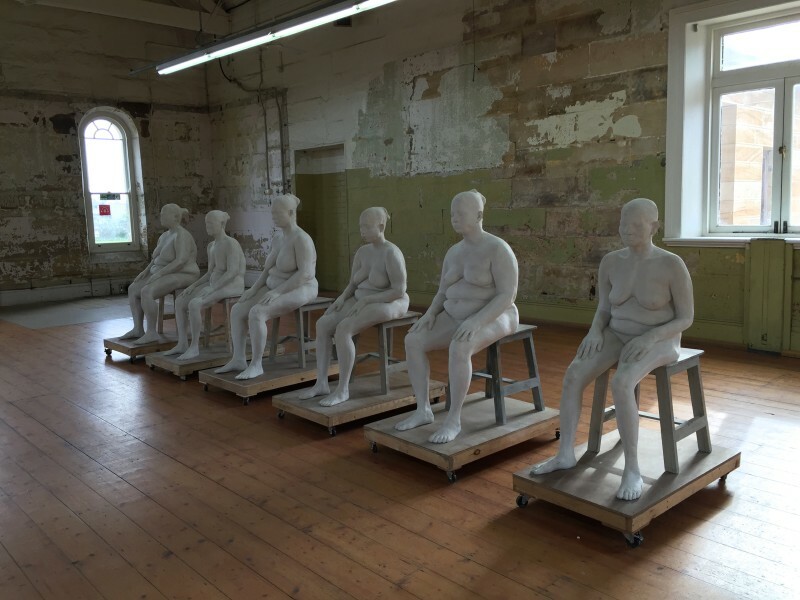 Bharti Kher, an India artist, produced a very impressive plasterwork of six seated women. They are so real that you think they will soon get up. The work radiates peace and respect. 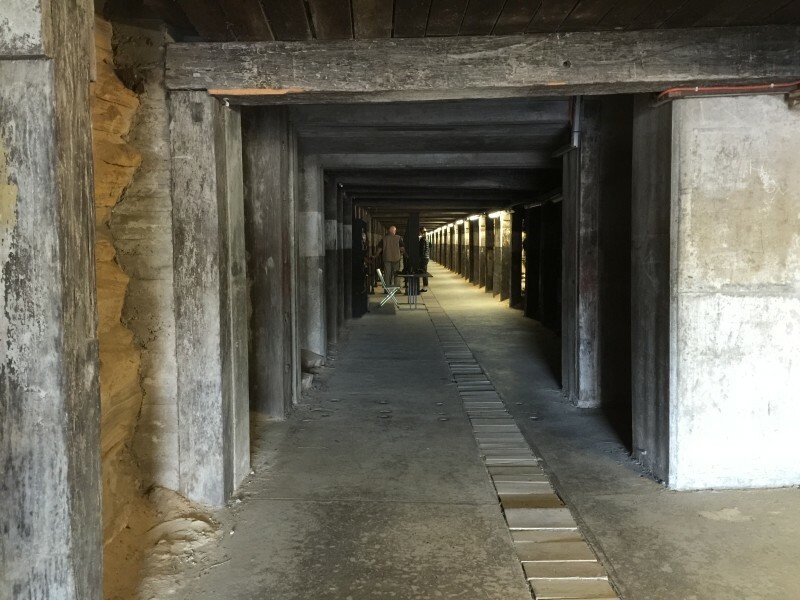 And last but not least, the audio work by Cevdet Erek, the Turkish artist/architect/musician, matches the old shipyard site perfectly, giving it an eerie atmosphere, inviting to reflexion and meditation. 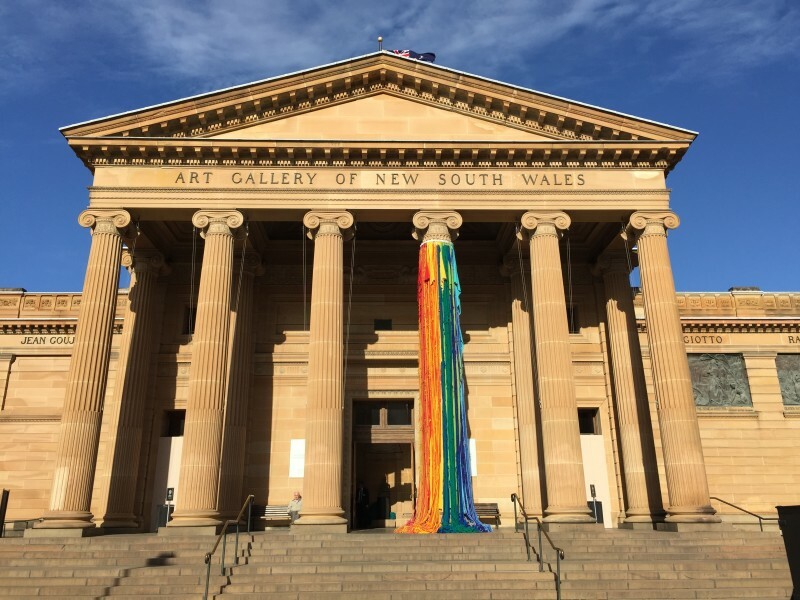 If you still have some time to spend, head towards the Art Gallery of New South Wales and finish off at the Artspace. The National Gallery of New South Wales hosts the Embassy of Spirits. The works of the artists that are presented here examine the role of ritual, religion and spirituality in contemporary society. When entering the Gallery, you will notice that one of the columns is dressed with colourful threads. This is the work of American artist Sheila Hicks whose art is at the intersection of art, design, craft and architecture. 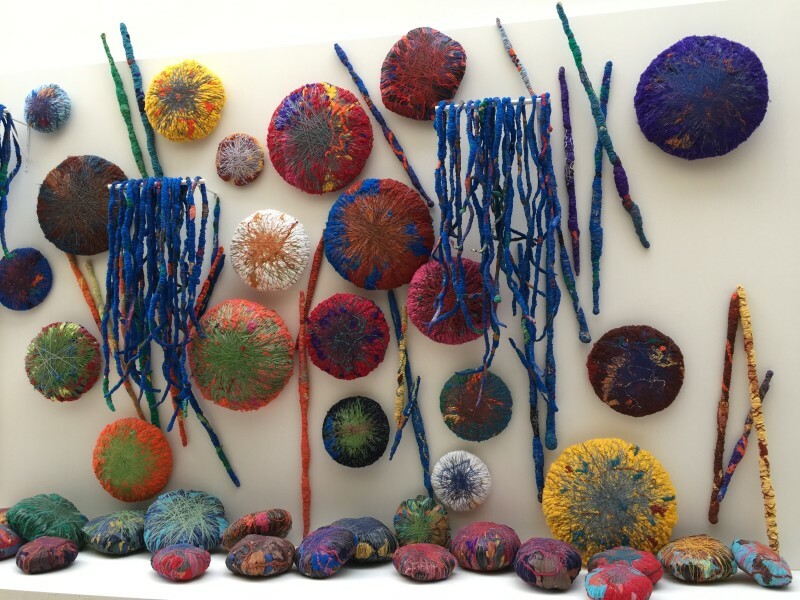 There is more of her works inside: a huge panel, a fresque, made of discs and sticks all enrobed with colourful threads. 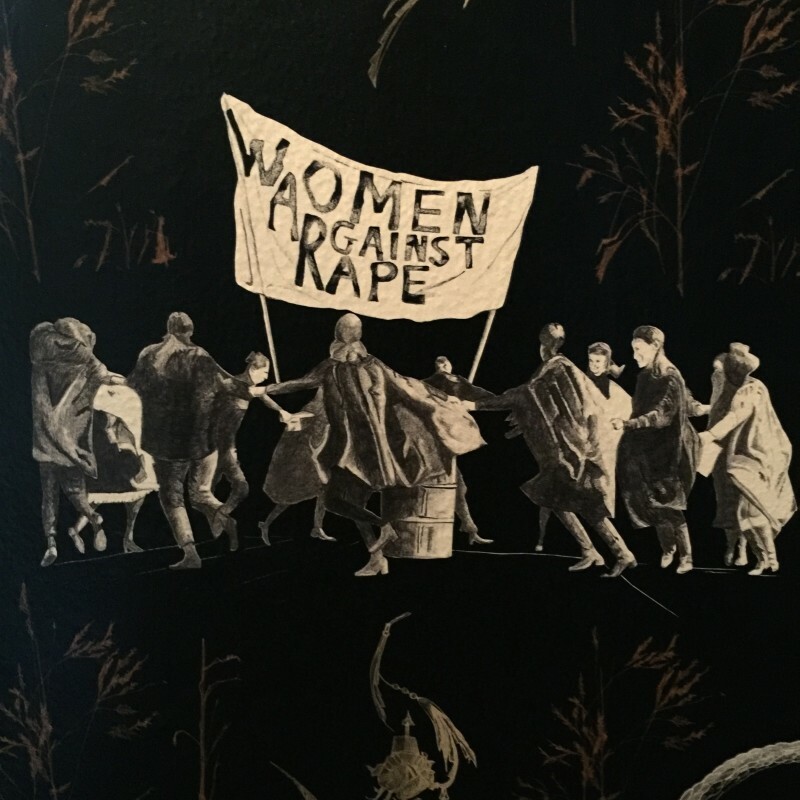 Then, in the main exhibition space, there is a work by Dane Mitchell, an Auckland artist, about which, honestly, I don’t know what to think. She collaborated with a homoeopathic practitioner to create “Remedies for Remembering (Al) and Forgetting (NaCl). It comprises two industrial containers, each one holding a formula either to aid or to erase memory. The liquids are sprayed on the windows of the gallery that, by mingling, are said to “provide the potential to remedy the body, the mind and the spirit”. What to think of this, I’ll leave it up to you. I loved the work by Australian artist Ken Thaiday Snr, a Meriam Mer people, mixing ethnic inspiration and technology. A rare combination. Dharis are traditional headdresses, but Thaiday’s ones become innovative dance machines and sculptural objects that document the living heritage and traditions of performance in the Torres Strait Islands. 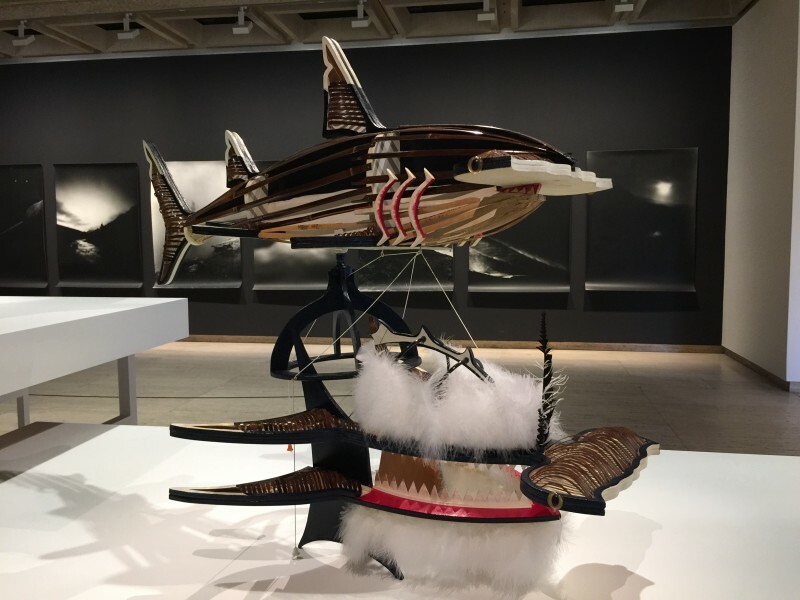 His Beizam (hammerhead shark) “references the early headdresses worn by followers of the ancient Bomai-Malu cult. Bomai was a creation hero with a powerful following, and cult members had a profound influence on daily life through their involvement in both religious and social affairs. During ritual activities, they wore elaborately constructed and decorated turtle shell masks that featured a prominent totemic animal. Thaiday sees Beizam as the king of the marine world and a “symbol of law and order””. I thought I would give the detailed explanation as described by the Gallery as it’s quite a unique work. Thaiday collaborated with Jason Christopher, another contemporary artist, for the automated Beizam. Then came Taro Shinoda. This artist from Tokyo has produced an installation of the most sublime kind. Honestly, this is one of my favourite work of the Biennale. Minimalist, profound and impactful. I will quote his words: “Our civilisation is too loud and the voice of Ki is too small. And the voice of Ki is guiding us towards harmony. Under this civilisation, how can we hear the voice of Ki?”. His room invites the reflexion on these wise words. It quiets the mind and heals the soul, for sure better than Dane Mitchell’s work. I really welcomed that moment. When you’re done with the Gallery, leave it by making a right turn through the gardens that surround the gallery. You’ll find a flight of stairs that leads to Woolloomooloo Wharf. The Artspace is just in front of the Wharf (check the opening hours though). 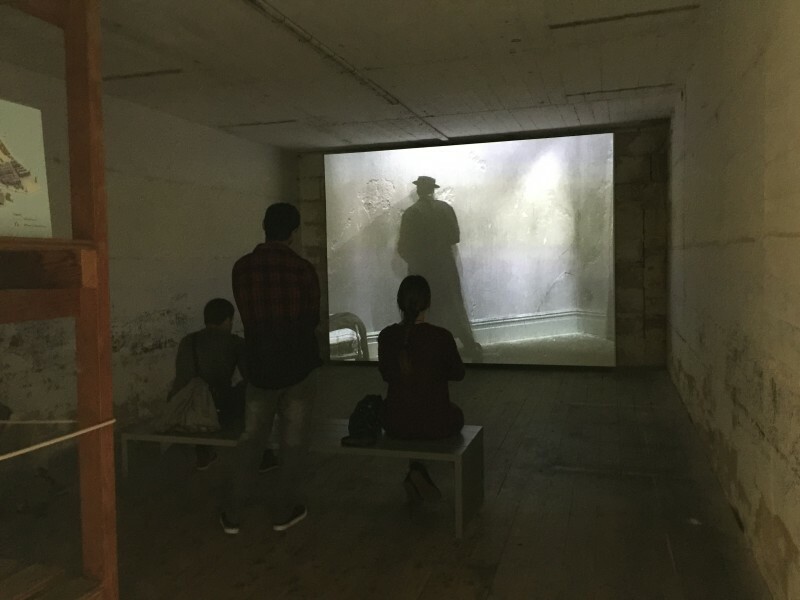 It’s a residency-based contemporary art centre, housed in the historic Gunnery Building. The Artspace is hosting the Embassy of Non-Participation. 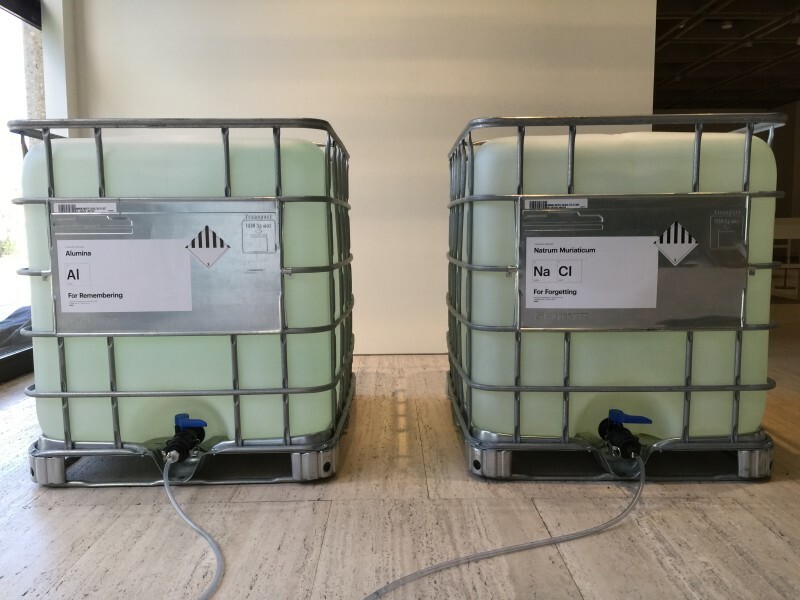 In this venue, artist duo Karen Mirza and Brad Butler consider how the act of ‘non-participation’ might also be an active, critical position. Just because I loved the architecture of the place, I suggest you pay a visit to the Mortuary Station. It’s a bit off but it will make you visit a part of the city you wouldn’t go otherwise. The building is one of the earliest and unique railway buildings in New South Wales. Designed by James Barnet, a famous colonial architect, it is typically made of sandstone and bricks and adopts a Venetian 13th-century Gothic style of architecture, with carvings of angels, cherubs, and gargoyles. Impressive. 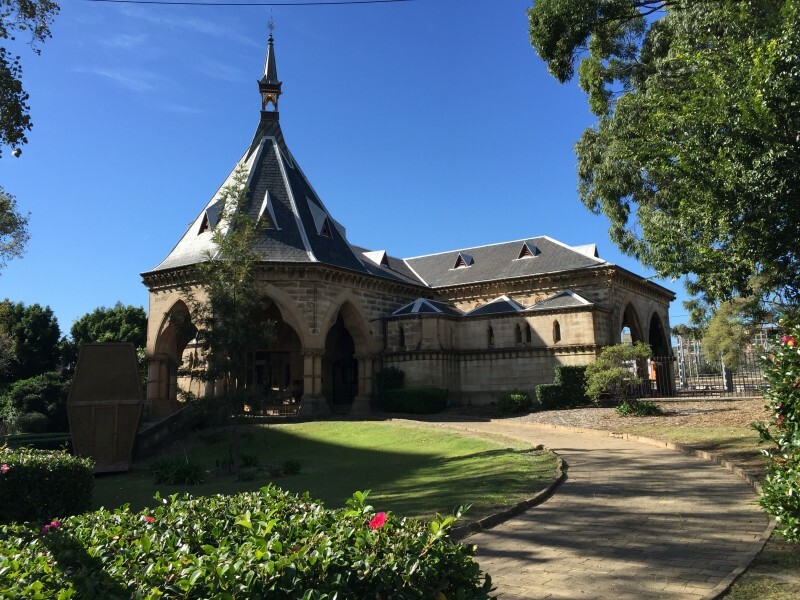 It was built as a stop along the rail line for trains transporting coffins and mourners from the city to the burial grounds at Rookwood Cemetery. 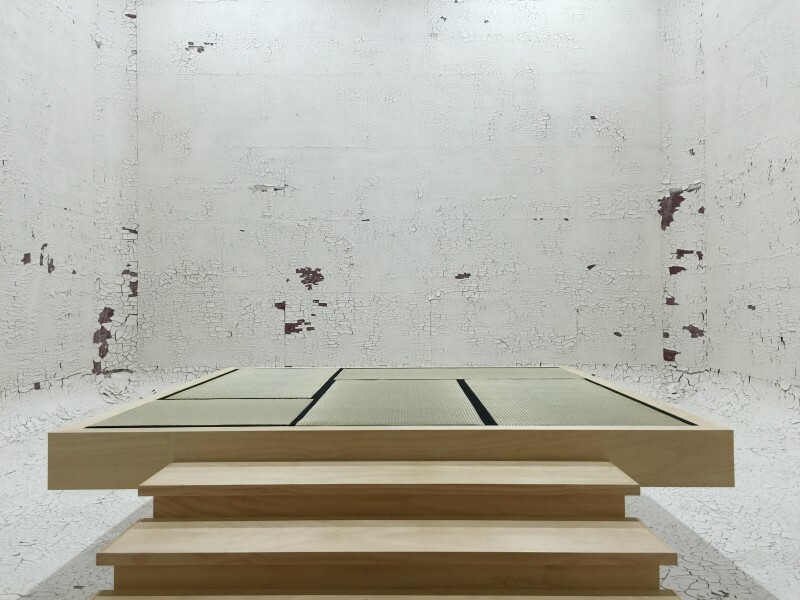 The Mortuary Station hosts the Embassy of Transition where artists Marco Chiandetti and Charwei Tsai engage with the cycles of life and death, as well as with rites of passage. 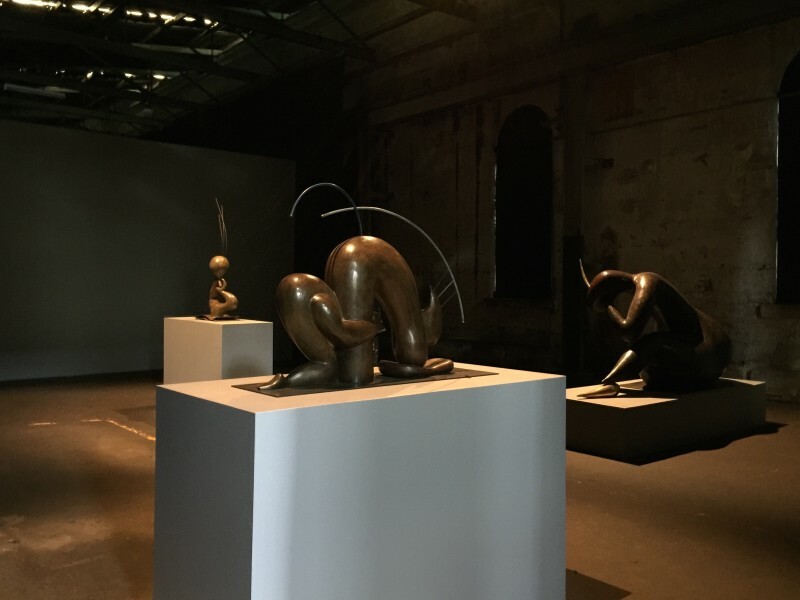 The Biennale has two other venues the Carriageworks and the Museum of Contemporary Art Australia (on Circular Quay). The Carriageworks is a place between Sydney University and the Australian Technology Park. 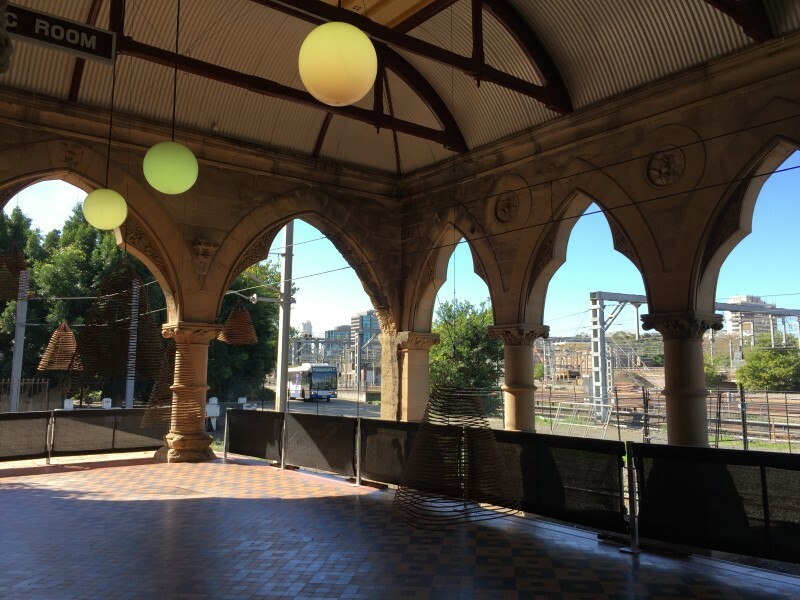 It’s a heritage-listed site, where the old Eveleigh Rail Yards used to be located. It’s now a place for cultural and art events. It regularly hosts the Sydney Fashion Week. It’s a great place again for industrial archaeology lovers. Besides this, I was not really impressed by the works presented. So I’m not going to give an extensive coverage on this. As for the Museum of Contemporary Art Australia, there are, strangely enough, very few works presented and I did not appreciate them either. So nice to see but no FOMO. Access to the exhibition places is free of charge. You can get a map for a donation of a gold coin. And that’s all the information you will get. I would have appreciated a leaflet you could peruse during or after the exhibition but nothing is available. The only explanation you will get is a board at the entrance of each embassy. Besides the six embassies, there seem to be installations in other places but I wish you luck to find them. For instance, there should be two at the Botanic Gardens. The first was supposed to be at the Fernery but, when I got there, there was a sign saying it had been moved to the Oriental Garden, where… it was nowhere to be seen. I made three attempts. Even the ladies at the information desk were clueless and had not been informed something was going on in relation with the Biennale. Except on Circular Quay, there was little advertising about this important event throughout town. No signs either. I think there is room for improvement on the organisation and communication point of view. Besides the organisational glitches, if you’re in town, don’t miss this event. Not only will you discover some great artworks, but also it will take to place off the beaten tracks. An excellent way to practice your flâneur’s skills.